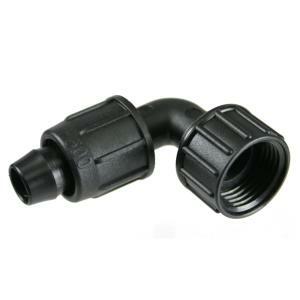 These Perma-Loc tubing fittings are used to connect polyethylene tubing to a outdoor water spigot or the end of a garden hose to achieve a 90° turn. The female threads on this fitting are FHT (Female Hose Threads) with a swivel and are compatible with common garden hoses. They are not compatible with PVC threads and other NPT (National Pipe Thread) fittings. The Perma-Loc connector segment of these fittings is compatible with Drip Depot polyethylene tubing of the corresponding size.